Stocks added to their gains in February. The S&P 500 recorded an additional 4.0% return, putting the index up 5.9% for the year. The bond market saw some reprieve as treasury yields fell and the broad U.S. bond market gained 0.7% for the month. Those in the financial markets looking for a give‐back in the so‐called Trump reflation trade were disappointed as pretty much all broad asset classes showed positive returns. The avalanche of headlines from Washington continues, but in actuality, not much is happening. The President delivered a more conciliatory speech to Congress last week that reignited optimism that his administration’s policies can accelerate the U.S. economy, and by extension, global growth. So far, there has been no substance or details offered for the planned infrastructure spending, a revamp of the tax code, and the repeal and replacement of Obamacare – arguably the three most meaningful policies for the financial markets. The “Trump trade” is mixed; the dollar continues to strengthen. But small‐cap stocks underperformed large‐caps, and treasury yields faded. Within the broad sectors, healthcare and financials led the market but industrials, previously a leader, paused. Rarely does one narrative drive the markets, and we may be seeing signs investors are beginning to re‐focus away from news, fake or not, out of Washington. Since Janet Yellen’s testimony to Congress in mid‐February, it’s clear the Federal Reserve is prepping the markets for a coming rate hike. A chorus of other Fed governors followed her testimony, making the case another rate hike is warranted as soon as this month. Perhaps the greatest tell has been the so‐called dovish members voicing their support for more rate hikes. So far this cycle, the Fed has been ultra‐cautious in removing monetary policy accommodation. Now, the FOMC seems emboldened to continue to hike rates soon as inflation has surprised to the upside and the job market continues to remain robust. Most encouraging is that the market seems comfortable with a tighter Fed policy, interpreting higher rates as a sign of a stronger economy. This is a healthy sign. The S&P 500 closed February at the 2,363 level, reaching a record all‐time high. While this milestone sounds impressive, that very same feat was accomplished just last month when the S&P closed at 2,278. These record closes may tempt many investors to time the market, selling stocks in anticipation of the “inevitable pullback”. However, consider the results of a simple market timing strategy of owning stocks only when the market is near the all‐time highs. * With that strategy, an investor would have earned 10% per year since 1988. Her performance would have kept up with someone who bought and held stocks, but she avoided the drawdowns that can cause so much angst. She would have bested her counterpart with a static 60/40 stock/bond allocation who only returned 8.9% per year. What may be surprising is, since 1988, the US stock market has closed within 5% of an all‐time high in nearly 60% of all months. It is not that unusual to be near record‐setting levels. 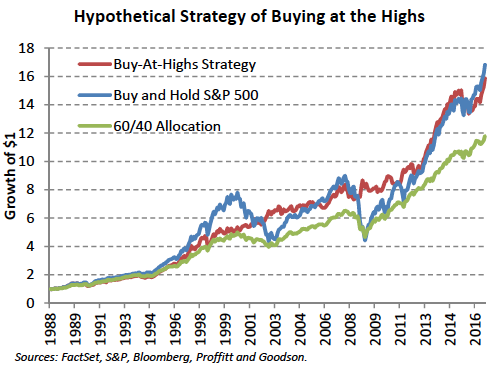 While we do not recommend this strategy, all of this is to say market timing can be very counterintuitive. Every financial market era has a different tone, a different political environment, and different issues to worry about. But the collective psychology rarely changes, and you are not alone in being concerned. This past month the Wall Street Journal reported hedge funds are holding excess cash – amounting to as much as a third of assets for some – to protect against any fallout from Donald Trump’s policies. Even these reputed masters of the universe struggle to see exactly how the future will play out. Even the most apparently obvious risks to financial markets do not play out exactly as one might predict. If you fear something, chances are someone else is worried too. That is how markets come to discount future events, however good or bad. That is not to say markets are perfectly efficient, but what can seem so obviously good or bad for stocks in general will not necessarily deliver the expected results. There is still no substitute for sticking to a plan that fits with your needs and staying the course. information is subject to change and, although based on information that Proffitt & Goodson, Inc. considers reliable, it is not guaranteed as to accuracy or completeness. Source information is obtained from independent financial data suppliers (Interactive Data Corporation, Morningstar, etc.). The Market Categories illustrated in this Financial Market Summary are indexes of specific equity, fixed income or other categories. An index is a reflection of the underlying securities in a particular selection of securities picked due to a particular type of investment. These indexes account for the reinvestment of dividends and other income, but do not account for any transaction, custody, tax, or management fees encountered in real life. To that extent, these index numbers are artificial and cannot be duplicated in real life due to the necessity of paying those transaction, custody, tax, and management fees. Industry and specific sector returns (technology, utilities, etc.) do not account for the reinvestment of dividends or other income. Future events will cause these historical rates of return to be different in the future with the potential for loss as well as profit. Specific indexes may change their definition of particular security types included over time. These indexes reflect investments for a limited period of time and do not reflect performance in different economic or market cycles and are not intended to reflect the actual outcomes of any client of Proffitt & Goodson, Inc. Past performance does not guarantee future results. * We calculated the impact of owning the S&P 500 only when the stock market closed within 5% of the alltime high in the previous month, holding the portfolio for the following month. The portfolio held a 10‐year Treasury in the months when the previous stock market close was more than 5% below the record high. Our calculation begins in 1988.